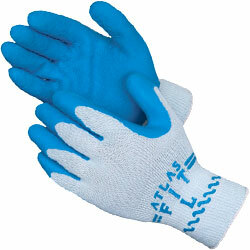 Atlas Fit 300 gloves are the best selling general purpose work glove. With their ergonomic design, superior fit and durability, Atlas Fit 300 gloves are the popular choice of professional gardeners, nurserymen, landscapers and construction workers. The tough latex palm coating with breathable back and outstanding grip make these work gloves the most functional and versatile. 10 cut poly cotton string knit seamless liner provides snug fit and keeps hands cool and comfortable. Patented dipping process allows glove to remain flexible, reducing hand fatigue. Conforms to contours of hand for maximum dexterity. Specially formulated latex palm provides excellent wet grip. These gloves outperform leather and cotton.